As in the rest of America, the days of the independent bookstore in Montana appear to be numbered ... doomed to extinction by the likes of Barnes & Noble and Amazon.com. There are still a couple of fairly-good local places to buy books here in Bozeman, but that's not the case for most of Montana's cities and towns. 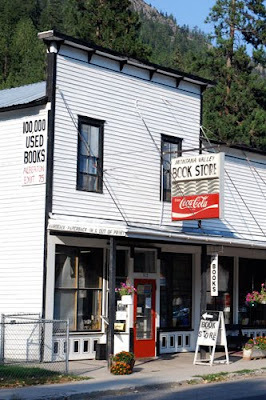 There's only one bookstore in all of Montana that I consider a destination in its own right, and its in a fairly unlikely spot: the little town of Alberton. There, the Montana Valley Bookstore has packed an old storefront with well over 100,000 used books, stuffing a maze of narrow, floor-to-ceiling shelves that extend even into the cellar. It's dim and musty and there's a resident cat -- a browser's dream, and one of the greatest ways to spend an hour or two that I can think of. Ha! I like the bookstore-Coke sign combo. I've never seen that before. Oh, you would absolutely love that place! I doubt that the owner lives much above the poverty level, but in every other respect it seems like it would be an extremely nice life. Only an hour or two? I read about this little place in the Montana Quarterly a couple of issues ago, and wanted to visit it. I'm glad it's "showcased" on your blog! And yep, it's a wonderful place, indeed. There are few things in life as much fun as prowling through a used book store ... and this is a fine one, by any standard.